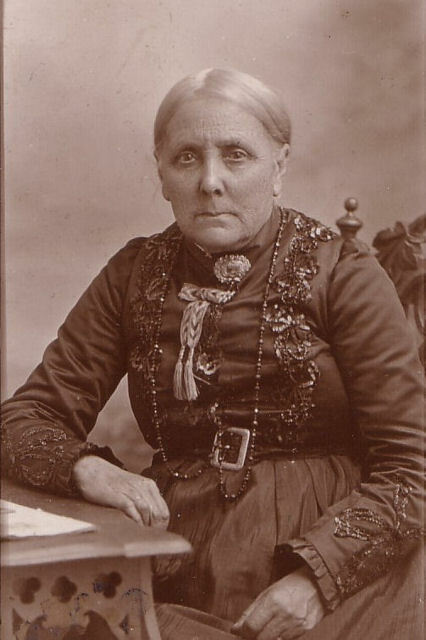 1838 July 22 Ann was born at Shildon to Elizabeth Adamson, spinster. Even though her mother and father eventually married, she retained her mother's (Adamson) surname until her own marriage. 1857 June 21 Ann married Robert Brown of New Shildon at The Parish Church, Shildon. 1861 census shows family living in Cleveland Street, Doncaster. Robert a locomotive constructor had moved on from Shildon. The works at Shildon had lost founder and famous pioneer Timothy Hackworth ten years earlier and engine manufacturing had waned in the meantime. 1863 Alice Ann was born at Newton, Ashton, Ches. See Lavinia below. 1865 11 Apr. daughter Lavinia was born at Rose Mount, Newton. On a map dated 1882 Rose Mount can be seen on the site of Daniel Adamson's iron works at Ashton. It seems more than a coincidence that Alice and Lavinia were named after Daniel Adamson's two daughters. They were related and both families lived close to the iron works. 1871 census shows that the family had moved to 41 Birch Street, Gorton. 1876 Feb 6th, Helena was born at 92 Stanhope Street, Arthur's Hill, Newcastle-on Tyne. 1881 census shows the family in Gorton again, back in Birch Street but at no. 49, not 41. 1921 Q3, Ann died age 83 in South Manchester ( Ancestry.co.uk / Taylor Family Tree / AuntieChicken60 ) w.i.p. In the name of simplicity data sources in general are omitted. However please feel free to enquire/inquire.